A 3 footed planter featuring a white pebble glaze on black. The base of planter features the Stanford Sebring trademark. 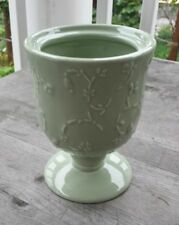 Lovely footed ceramic celadon planter, by Hallmark China, marked “HMK LIC” on bottom. In excellent condition. It has a stamp on the bottom that says "Mottahedeh.". It has a few small cracks on it due to it's age so make sure to look at all the pictures. Antique early 1800's hand painted planter. Nice condition. 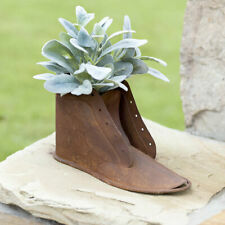 Give your garden the boot! Gorgeous decoration with satyr head and dragon handles. 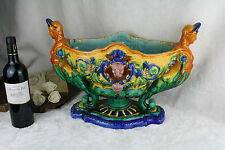 eXCLUSIVE RARE jARDINIERE Planter. circa 1900. barbotine ceramic. Barbotine majolica. eXCLUSIVE RARE jARDINIERE Planter. art nouveau circa 1900. gorgeous decoration with caryatids and lion headss. I believe this piece was made in the factory in Houry, France. The mounts are just stunning with the bottom having lions faces on the feet with beautiful ornate handles on the sides with a reticulated bronze mount on the top. Poppies and irises embellish an amazing wall pocket planter that's every bit as beautiful alone as with your added flowers. A pair of these toscano exclusives is exquisite flanking a doorway, fireplace or garden gate. Southwestern Pueblo Style. Glazed with terra cotta like inside - perfect for plants, succulents. 16" Tall Vtg Pierced Etched Metal Jeweled Flower Planter Urn Vessel Vase RARE! 16" Tall x 10" Wide - Lovely Etchings Of Flowers With Gorgeous Jewels In The Center. One Of A Kind Made In India We Believe. Very beautiful. Spring is fast approaching. TAPERED WINDOW BOX/ FLOWER PLANTER. Good to Very good overall antique condition. A mustard yellow color planter with crimped sides. The base features the hand scribed "Dryden" with early Kansas 7F mark. One of the hooks looks like it’s bent on top, but it was actually screwed in crooked when it was originally made. It’s really no big deal though. I’m sensing the 1930s. Wall Planter. This hangs on the wall and has 2 pots for holding plants. Use indoors or outside. Hanging Planter - Set of 2. Perfect for flowers, plants, fruit, etc. You can use these indoors or outside. Sold as a set. Large- 15" L x 6" deep x 30" hanging. While this is nor marked. it is the colors you expect to see in hull bow knot. even a Halloween present. LOL. a nice old primitive. so you never know. heh heh. sigh. a LOT more fun. Red Truck Planter. Wheels do not spin. This is not watertight. Truck Bed - 6.75" long x 4" wide x 2" deep. They are made from ceramic with a raised honeycomb design. They do not have any drain holes so you could use these for other applications too. Sold as a set of 3. Mini Bee Pot - Set of 3. Suitcase planter has a rustic, red painted finish and scroll feet. This is ideal for artificial or pre-potted plants, florals or even storage on your counter. This is not watertight. 1: UPCO USA 102 - 8" pink. Height: 3-1/4". This pottery planter is pre-owned. I included photos to show the condition. Suitcase Planter Set. These are not water tight. Sold as a set of 2 planters. VINTAGE 50s Ceramic Iridescent Ladies Hand Holding Sea Shell Planter Vase Vanity. Condition is Used. Shipped with USPS Priority Mail. 7.75” tall , and roughly 4” inches wide. The shell has a beautiful iridescent/pearlescent finish. Would make an adorable brush or makeup holder for your vanity. Offered for your consideration is this vintage UPCO USA Pottery Art, and is a PINK Bow Green Brown Drip Planter #917. Condition is Used, with no chips, cracks, or flea bites. It is 8" x 4 1/2" x 3"
Creative hollow hanging ceramic planter, ideal for the creative gardener. Perfect for hanging from window, ceiling, shelf, or sitting on the table. RARE BRAND NEW BERNIE SANDERS "FREEDOM OF CHOICE" LIMITED COLLECTOR'S CHIA PET! Bernie Sanders Chia Pet. Chia Pet Planter! This Chia Pet is suitable for a range of interests, including collectors, enthusiasts, and children! "Freedom Of Choice" ~ Bernie Sanders. Collector's Series Handmade Decorative. S ize : 5 x 5 " front, opening 2. 5 x 1 ", base 1. Condition is perfect. No chip or cracks. No crazing. Onlyatiny bit of wear on base. Super clean. Beautiful Shawnee planter featuring a southern belle standing by a wishing well and holding flowers. In great condition for its age. Minimal crazing. Think Spring! I now have NIP Hot Wheels Diecast Cars which make great gifts for your little ones or a collector in your life. Approximate overall size is 4" x 4" x 5 1/2"H.
Stunning piece perfect for your Paris apartment. Approximately 9” high 7 1/4” wide. No crack or breaks. Minor loss of gilt finish. SIMPLY ADORABLE. PINK LAMB NURSEY PLANTER BY CAFFCO JAPAN, BLUE YELLOW ACCENT COLORS. VINTAGE WHITE CERAMIC MADE IN ITALY STICKER CHIMP MONKEY HANGING PLANTER. Condition is Used. Shipped with USPS Priority Mail. Here is a lovely hanging monkey. The rope looks to be original. He is 19" tall and from hand to toe , 8"wide and 6" deep. It is being sold as it is shown. No chips cracks or repairs. I have taken lots of photos to show all angles. Please email me with any questions and take a look at my other auctions for other great times.